(March 14, 2019) The Golden Harvest (2019, 85 min) made its debut on March 4, 2019 at the Thessaloniki International Film Festival to a full house. The screening was followed by a lively Q & A that continued onto the pier along the fabulous arthouse area of the city where the majority of the festival takes place. Greeks have the highest consumption of olive oil in the world, so it is no surprise that the audience reacted with tears and laughter to The Golden Harvest, which weaves the 6,000-year old love story between the people of the Mediterranean and their olive trees through personal tales in Palestine, Greece, Italy, Spain and Israel, including that of the filmmaker’s father. “We are delighted that the film debuted in Thessaloniki, one of the top 10 international film festivals, and in a country where part of the film was shot,” says Alia Yunis, the director/writer. The Golden Harvest is not just a foodie film, although there is plenty for foodies to savor, including learning from one of the top tasters in the world how to evaluate oil. But through a unique cast of characters, the film tackles the social and political dimensions of olive trees, including environmental issues, war, globalization, the European Union, marketing and branding, and Fair Trade, all of which impact this genie in a bottle. “After seeing this film, I changed my mind about selling my family’s olive trees,” one audience member announced during the Q & A.
Alia was joined on stage for the Q & A by Pavlos Georgiadis, who is the youngest farmer in Makkri, his village in the Thrace region of northeastern Greece. His family is one of the many families that the film introduces to viewers. The film is next schedules to play at the Minneapolis St. Paul International Film Festival in April. To contribute to the financing still needed for the marketing and distribution of the film, please visit the non-profit, UNESCO member NGO collecting funding for the film: https://www.heritage-activities.org/food-and-heritage All individuals and institutions who donate receive a mention in the thanks, as well as their logo in the credits, if desired. The Crew in Salento, Italy. Photo by Fabio Fassone. people parking plastic chairs near the olive trees planted inexplicably along the city’s public sidewalks. They’d climb onto the chairs and start picking the olives off by hand and putting into sacks. What I’ve learned making THE GOLDEN HARVEST is that they are picking too early. The olives are still too green for oil. But if they want them for table olives, they’ll do okay. Seeing these people today reminded me of why we’re making this film and just how hard it is to make a film. So I thought I’d give a little update. We’re in post production now. We’ve filmed in four countries, and have a couple more to go. Along the way we’ve sampled a tremendous amount of great (and sometimes not so great) olive oil. When I sample those oils at home now, they remind of the exact trees they come from, because they taste and smell of the wind and sea and soil of that spot. 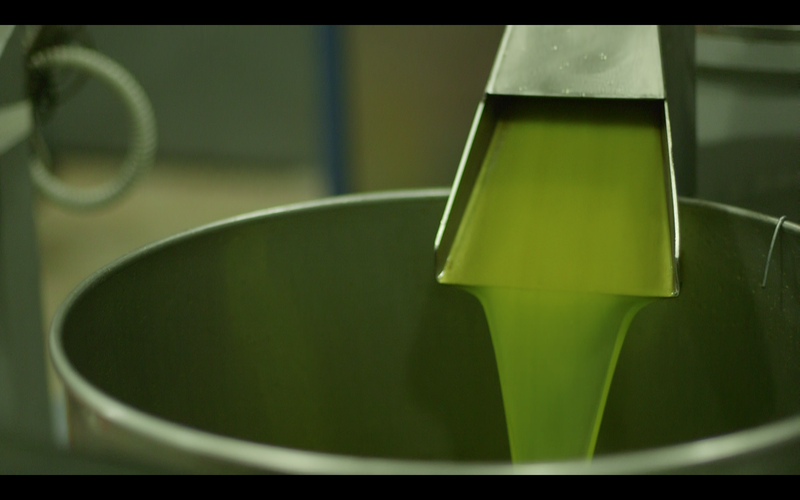 Maybe that is one of the reasons olive oil stirs up so many emotions. The idea for this film began several years ago when my father passed away, and I tried to think of the times where he was happiest. And it was around the time of the olive harvest,when people would come to him to taste the oil from their harvest. My father hadn’t lived among olive trees since his youth, and I’m not sure he knew what virgin and extra virgin olive pressing meant, but that passion for the oil—for great oil—never left him. How could it? It was in almost everything he ate, and sometimes he just had a straight shot of it as a pick me up. When I started mentioning some of the olive oil stories of mine to other people with Mediterranean roots, it inevitably formed led to them telling me their own stories, all with as much emotion as if they were telling me about their first loves. 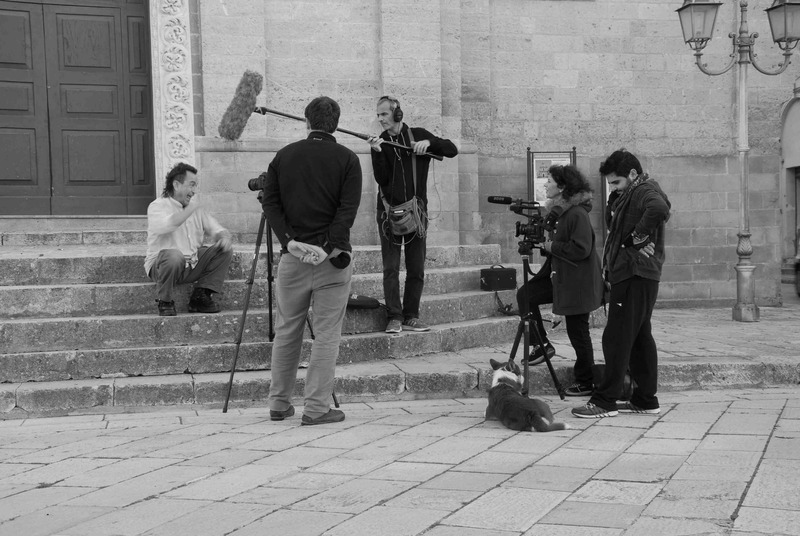 And so the process began…it’s been a regional effort, with great co-producers in Italy, Greece, Spain and Palestine. And we’ve brought together just some of the stories of that people along the olive oil route, tales of love, faith, pain and triumph—not to mention science, medicine and needless to say, great food. In the coming months, I’ll start introducing you to the crew and the people we’ve met–along with their favorite olive oil recipes. For years, my friend Hala Gabriel has been working on documentary about the destruction in 1948 of Tantura, her family’s picturesque village in what was then Palestine. For a Palestinian to even attempt such a project as hers is to face unfathomable odds, which she has. Finally, she was able to get to Tantura in what is now Israel to film the remaining footage. Below with her permission is the letter she sent to her friends upon returning to the US. It is unedited, including the photo. Believe it or not, I just returned from my trip to Israel. I finally did it. I filmed the remaining things I needed in Israel for my documentary. I even met with several of the soldiers who invaded my dad’s village Tantoura, exactly as I intended to do. I met the Israeli general who was on the front line. One Israeli soldier actually sent “greetings” to my great-uncle. He recalled him well. They all very old men now and I am lucky to find them before they die… I was there only 6 days, but I have to say that was emotionally enough for me. I got back this afternoon and I’ve been sleeping most of the day. It will take me a while to process the experience. The Palestinian situation is much, much worst than I ever imagined. It’s much worse than the news can even describe. 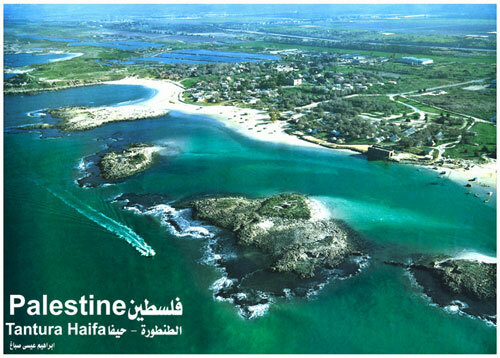 It’s indescribable to be honest and I didn’t even see the worst of it – I didn’t see Gaza. What I saw was a refined cross between concentration camps, prison camps and a form of modern day slavery. The Palestinians I met wouldn’t dare to speak to me of their life in front of the camera. Not even the distant relatives would. They live in constant fear. One of them told me that he spent 2 and a half years in prison when he was 12 years old for throwing a stone. That’s where he learned Hebrew. He said he would prefer never to speak Hebrew, but since he’s not allowed to own his own business he has to speak Hebrew to his Jewish boss. My amazing Israeli/Jewish cameraman Amir I hired, he gave us the grand tour as he videotaped and documented along the way. As he explained and showed us – The majority of Palestinian villages throughout Israel are sealed off with prison style walls (in fact the same architect that designs the actual Israeli prisons designs these despicable walls!) Most villages have only foot access entry and exit – usually only one and they are heavily monitored. Palestinians in the occupied territory are given green license plates for their cars while Jews have yellow – this is to enforce the “Jew” only roads. I met one Palestinian man at the Ramallah check point who was born in Jerusalem. He told me on camera that although he was born in Jerusalem they will not give him “citizenship” of Jerusalem, not a Palestinian or Israeli “citizenship” – he only has a “residency” green card even though he was born there and all his ancestors were born there. If he leaves Israel for more than 3 years he will lose his residency. Although he is in his 40’s, he is not a citizen of any country even though his entire family history was in Jerusalem. I visited the ‘Atlit’ prison camp where my father, uncles and grandfather where held for one year in 1948 after Tantoura massacre. Ironically that prison was built by the British to incarcerate the Jews. A portion of it is now a museum. We took the “tour” and were not surprised that the tour guide some how had no idea what the camp was used for between 1948 and 1951. That part of its history was some how “missing” or “erased” from the records – as so much of the Palestinian history was. I so wanted to tell our tour guide that my father too was held there, but I became afraid – so did the Jewish friend I was with. I traveled to Israel with a Jewish friend from the US named Frederick. He had never been to Israel before and had no interest in going. But he was interested in helping me doing my project, the reason why he agreed to join me. It was astonishing how differently the immigration officers handled him versus how they handled me. His family were holocaust survivors from Germany and he understood firsthand the meaning of atrocities , racism and ethnic cleansing. He told me at one point that he was ashamed to call himself Jewish. He also pointed out that the Israeli’s have successfully managed to recreate the Warsaw ghettos. I was certain that had not asked him to travel with him the Israeli’s would not have let me in at all. They questioned me for 7 hours at the airport. They repeatedly called me a liar. (Apparently a “tactic” as I learned from the “proud” retired Israeli soldiers that taken my family home.) At the airport they took my belongings, my phone and they threatened me. On the way out of Israel they strip searched me and dissected my suitcase. They wouldn’t allow me to take it as carry on, although it was smaller then the carry-on that Frederick was permitted to take it in. In fact, my suitcase never arrived to New York. I’m not sure I will get it back or not. Fortunately there was nothing of great value but it’s the principle. They also seem to have destroyed my cell phone. It no longer holds a charge. Having said all of that… my family village Tantura is beyond beautiful. It is paradise on earth. I always wished to be from a beautiful place and indeed I am. The remnants of my family home gives a clue as to the aesthetic, thoughtfulness, wealth and beauty of the village and the homes that once were. One of the Israeli soldiers I interviewed who saw the village a few months after they had taken it told me that he can’t describe in words how gorgeous the homes were. It was a very rich village. My family was very wealthy. I understand fully why the people of Tantura continue to cry over 60 years later and long to return to their homes. The majority of the villagers still live in refugee camps today. My family is perhaps one of the very few that currently does not live in a camp. As I wandered around the ruins of my family home, a fisherman approached. He was apprehensive to speak to me at first. He thought I was an Israeli. When he learned who I was he gave me a hug. When we left Tantura to the neighboring village of ‘Fradis,’ I was met with a crowd of people who are blood relatives. Each one introduced themselves and explained how I am related to them. A half-aunt named all her children after her brothers and sisters who she never seen again since the invasion 1948. Their warmth and hospitality was beyond description. They made a feast for me and my filming crew. Delicious fresh caught fish from Tantura. Before I left, one cousin called to say good-bye and to let me know how much the family loved me. They know that the chances of Israel ever allowing me to enter again is minuscule. My heart is so broken. I bleed in pain for the people living under the occupation and the Palestinian “Israeli’s” who live in a daily horror of fearing for their life and livelihood in the quest for simply being. The Jewish Israeli’s who are aware of the horror also live in their own prison camp and ghetto – it just has better amenities then the Palestinian villages as they described it to me in their own words. They told me that it’s easy to live in the Tel Aviv “bubble” which they also described as the “Disneyland” or “Miami Beach” that Israel sells to the world. There is even a separate road from Tel Aviv to Jerusalem that avoids the horror of the walls, barbed wire, occupation and imprisoned villagers. I met a lovely gal at the hotel who told me she had only heard about people like me, but never met any Palestinian whose family was expelled. It was like an urban legend. She is originally from Holland. She gave me her contact information and asked to stay in touch, unfortunately it’s in my suitcase. I may have to call the hotel later and see if I can get it again. Even my sound technician , was n Iraqi Israeli Jew told me he had no awareness of the history of Palestinians like myself. They don’t teach it in Israeli schools. In fact they are working on creating a law that will make learning about the “Nakba” (the Palestinian disaster) an illegal act. He told me he had trouble sleeping the last several nights after shooting. He hugged me and said he hopes I will find peace after this. I am not sure when I will find peace, but I pray that my film reaches the appropriate audience. I pray that it is relevant. I still need funds to complete post production. If anyone has any idea’s or any access to fund resources, I will be deeply appreciative. If anyone would like to contribute to my project, any amount is most welcome. Each person I have emailed has listened to my story and my project and has offered support along the way. I thank each of you.